Blizzards that were leaving some areas with as much as 70 centimeters of snow (more than two feet) all but paralyzed transport in counties stretching from Agder to Oslo and Østfold on Tuesday. Nearly 20,000 households were also without electricity Tuesday morning. 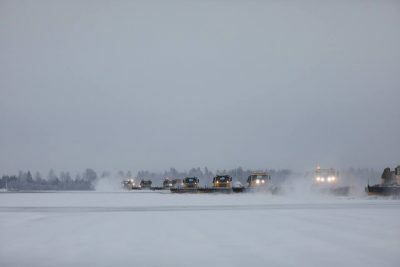 Oslo’s main airport at Gardermoen was scrambling to keep up with the onslaught of heavy, wet snow but warned of flight delays and cancellations throughout the day. Sandefjord’s Torp Airport was forced to close Tuesday morning. The masses of snow and strong winds that reached hurricane strength in other parts of the country also toppled trees and power lines, leaving many homes and businesses in the Agder and Telemark counties without power. Schools and day care centers in Skien and Siljan closed because of the lack of power, while Skien mounted a crisis team to deal with what many described as a “chaotic” situation. In Drammen, commuters were stranded when the city’s train station actually closed, because of snow-induced problems with its signal system. Many train lines in and around Oslo also had to close because of all the snow. Passengers were offered alternative bus transport but then there were problems acquiring enough busses, and the roads were as clogged by snow as the railroad tracks. Police in Oslo, Asker and Bærum warned of extremely difficult driving conditions and urged motorists to “leave your cars parked.” Oslo city streets were covered with mounds of snow and several were blocked by trucks that got stuck or spun out of control. The main E18 highway at Askim southeast of Oslo was partially closed after the strong winds loosened heavy overhead road signs that were threatening to crash down onto the lanes. “Right now we also have three to four large trucks stuck in the snowdrifts,” Finn Håvard Aas, operations leader at the Follo police station told Norwegian Broadcasting (NRK). Even a heavy snowplow vehicle overturned near Enebakk Tuesday morning. Snow was due to keep falling, with fully 80 centimeters measured by late morning in the hills north of Oslo, and 1.2 meters (more than three feet) of snow at higher elevations in Vestfold around Sande.